Daw Khin Myo Chit, a well-known author in Myanmar for her stupendous writing skills, said “it is quite impossible for a Myanmar to survive without knowing on which day of the week he or she was born”. Therefore, for a Myanmar, “what-day-born” (ေမြးတဲ့ေန႔) Mway:-te.-Nay. (literally meaning birthday, but actually meaning the day of the week on which you are born) is a very important word in his culture. When you ever ask birthday for a Burmese, it means to him on which day of the week was he born. Burmese people don’t really consider the date they are born, then actually Burmese birthday occurs once a week. And it’s what-day-born. When you go and visit a pagoda in Myanmar, you’ll see everybody praying from each respective point (also known as corner), corresponding to the day on which they are born. There are a total of eight points of compass in every pagoda, with red signboards, usually accompanied with a figurine of a strange animal. But your guide can definitely explain about those eight points and figurines. Actually, each day of the week is assigned to a specific point on the compass and a particular mythical animal. If so, there’s a question. What about the eighth cardinal point, is it left vacant since there are only 7 days in a week? Actually not, it’s simply the Wednesday that is divided into two portions so that all cardinal points can be represented and be even (”Even” means lucky in our culture). 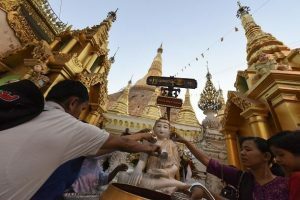 Every Burmese Buddhist usually has to pay homage to Buddha on their week birthday, and while in the pagoda, at the specific cardinal point that represents their birthday, there would usually be a statue of the corresponding animal there. Therefore, “what-day-born” (ေမြးတဲ့ေန႔) is quite a common and important word in Myanmar. If you keep in mind this information, you’ll easily find in which part of the pagoda you should pray. The concept is very similar to the Chinese or Western zodiac. The Chinese one being based on the year during which you are born, while most of the western countries follow the zodiacal signs, which are mostly based on the month of birth. But, to be clearer just take a look to the following table, which shows you the details of the Burmese signs. For example, if you’re a Monday-born, your figurine animal is a tiger and you have to pray from the eastern corner of the pagoda. 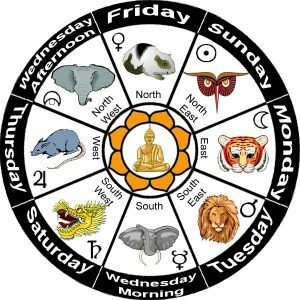 In this table, Rahu is the second half of Wednesday (from 12:01pm to 12:00am) and tuskless elephant is representative of Rahu’s Figurine. You can also see that this tables shows planets that corresponds to each day, which is the base for Burmese astrology, but the background theory for the planets is not clear enough. Some say it came from Hinduism and does not relate to Buddhism anymore. And in some other’s words, it is in the repositories of Buddha’s scriptures. But nobody yet seems to have been able to prove any of these theories. 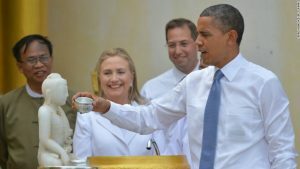 But “what-day-born” concept is not only used to determine when and where you should be praying Buddha at the pagoda, it is also used for many other social reasons. For example, there is a saying in Burmese culture which goes like this: “Mway: Nay. Thaut Kyar Ta Nin Lar Kay Thar San Nyat Ma Pyu Yar” (ေမြးေန႔ ေသာၾကာ တနလာ ေကသာ ဆံညွပ္ မျပဳရာ”), literally, is means Monday and Friday – No Hair Cutting, it indeed warns not to cut hair on Monday, Friday or on your week-birthday. People strongly believe cutting hair in such days brings bad luck. In addition, Burmese people also used their birthdays to choose their spouse or business partner. For instance, you should not choose a Friday-born girl as your wife if you are Monday-born man because of the saying “Dammar Thaw Ka Innwa Yar Zar” (ဓမၼာ ေသာက အင္း၀ ရာဇာ) which is supposed to be remnants of ancient wisdom. And it also says if you are Sunday-born you will never get good Wednesday-born friends. Sometimes, the date for a special ceremony; such as company opening date or house-warming event; is guided by a professional astrologer whose ideas come mainly from the basis of “the-day-you-are-born” concept. The astrologer can even guide on which day to choose if you want to go praying or what you should offer to whom on what day, all of it to get a better life and “Karma”. You can even get the suggestion from the astrologer for your wife’s affairs, all the information coming out from that very concept. Last, but not least, there is another usage of “what-day-born”, and it is really helpful to know on which day people around you are born. In our traditional naming system, each of the eight days, or eight cardinal point carries a certain number of names, therefore, therefore your name will also depend on which day you are born. 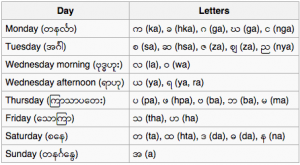 For instance, names starting with the Burmese consonants Tha (သ) and Ha (ဟ) are for Friday-born. Consequently, people with one of these consonants to start their name, such as: Thura (သူရ), Thiha (သီဟ) or Haymar (ေဟမာ), are usually born on a Friday. So let me share a chart that matches the day of birth with the first letter used in a child’s name, though the naming system is not universally used anymore nowadays.